55 biggest Polish NGOs associated in platform „Grupa Zagranica” [„the Foreign Grup”] issued special appeal to Polish authorities and public opinion „to take immediate action to prevent escalation of military conflict and humanitarian catastrophe in Kurdistan Region”. The appeal has been sent to Prime Minister of Poland, Speakers of lower house and upper house of Polish parliament as well as politicians and journalists. Issuing appeal is a result of last week meeting of Ziyad Raoof KRG Representative to Poland and delegation of Barzani Charity Foundation with Villa Decius Association which prepared the appeal and led to joining the other Polish NGOs in this initiative. 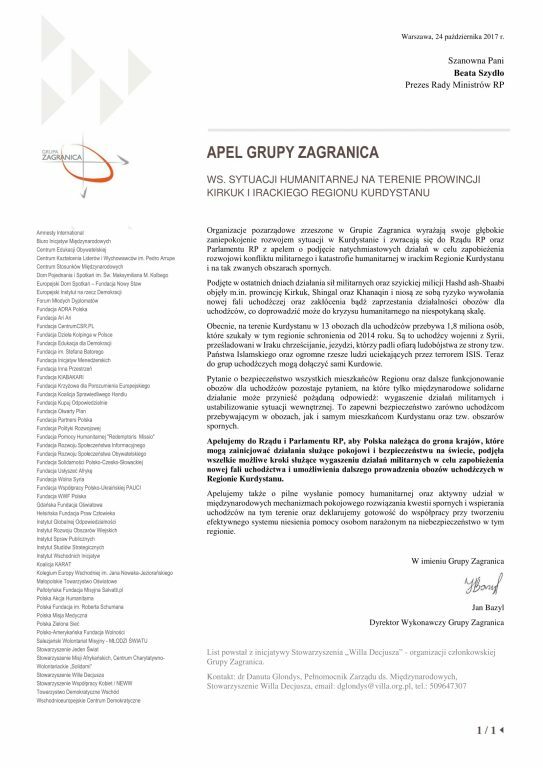 Non governmental organizations associated in “Grupa Zagranica” express deep concern about situation in Kurdistan and address Polish government and parliament with appeal to take immediate action to prevent escalation of military conflict and humanitarian catastrophe in Kurdistan Region and so-called disputed areas. Actions take by military forces and shia militia covered Province Kirkuk, Shingal and Khanaqin. It may result in another wave of refugee and disruption or even shutdown of refugee camps activities. It may contributed to humanitarian crisis on unprecedented scale. Currently, in Kurdistan there are 1 800 000 refugees who have been looking for a shelter there since 2014: war refugees from Syria, Christians persecuted in Iraq, Yezidi victims of genocide committed by so-called Islamic State and huge masses fleeing from terror of ISIS. Now the Kurds can also become the refugee group. The question of the safety of all the inhabitants of the Region and the continued functioning of refugee camps remains a question that only international solidarity can answer by elimination of military action and the stabilization of the internal situation. It can secure safety of refugees in refugee camps as well as inhabitant of Kurdistan and so-called disputed areas. We appeal to Polish government and parliament to take any possible steps to de-escalate military actions with the aim of preventing another wave of refugees and making possible further existence of refugee camps in Kurdistan Region. Poland definitely belongs to the group of countries that can initiate actions for peace and security in the world. We also appeal to urgently send humanitarian aid and actively participate in international mechanisms for peaceful resolution of disputes issues and the support of refugees in this area. We declare our readiness to cooperate in creation of effective system of providing aid to vulnerable people in the region.